Body Transformation: Muscle Beats Skinny Fat Every Time! Anna wasn’t classified as anorexic, but she was borderline. It took a complete change of thinking for her to survey the damage, grab some iron, and revamp her physique! I struggled with being underweight and too skinny. Until a few of years ago, I was stuck in a "skinny trap" and thought the definition of health consisted of a number on the scale, eating salads, running, and having skinny legs. I was thin. It wasn't to the point of anorexia, but I teetered on the edge. I was constantly exhausted and saw weightlifting as something only for men and women who wanted to be massive like men. I wanted nothing to do with it. 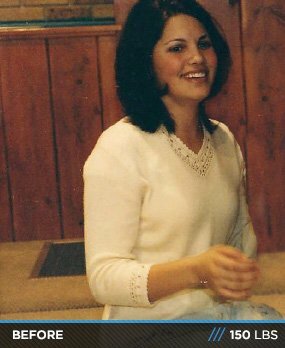 I struggled to gain weight in my teens due to sad circumstances and saw myself as the ugliest person imaginable. When I went to college in August 2003, I weighed less than 100 pounds. Because of my work and class schedule, the only cafeteria I had time to eat at served fried chicken, pizza, and burgers, so I gained nearly 50 pounds by the end of my first semester. I struggled to get my weight under control for the next three years. During the first semester of my senior year, I took a physical education class called Physical Fitness where I ran and lifted weights to pass the class. I also enrolled in a kayaking course and got in decent shape. I kept my weight at a reasonable number until graduation, but didn't maintain my muscle mass after the classes ended. I got married a few months after graduating college and was pregnant not long after. Throughout my first pregnancy, I ate normal and went on walks sparingly, but that was the extent of my physical activity. By the time I delivered, I gained 35 pounds, which was an acceptable amount. The weight came off within a few months, but I went right back into my "skinny" process until I weighed 110-115 pounds, which at 5-foot-8 was far from ideal. Again, I was skinny and had no energy. I joined the local volunteer fire department where I stayed until we transferred to Indiana in 2010. The department training was good and I figured that was enough to stay in shape. When we moved to Indiana, I got a membership at the gym where I worked and begrudgingly decided to try weightlifting. I kept with low weights and high reps so I didn't bulk up. It was intimidating to say the least. Shortly after moving, I got pregnant for the second time, but was determined to stick with my workouts. I listened to my body and doctor throughout. I worked out 5-6 days per week throughout the pregnancy, including the day I went into labor. I cannot describe how vast the difference was between pregnancies. I gained the same amount of weight both times, but had far more muscle when the baby weight came off nine weeks after the second delivery. I had energy to spare despite having two kids to care for and other responsibilities. Helping people has always been second nature to me and I desperately wanted others to experience the same success, so I tested and received my NFPT personal training certification. Health cannot be measured in pounds. It's calculated through energy and progress. There's always room for improvement. You are only limited by how much you believe in yourself and the ability to achieve your goals. It's all or nothing. I started lifting so I could learn the moves and worked with some cardio. I cleaned up my diet and consumed 2,300 calories per day to compensate for the calories I burned while training. Every morning, I rolled out of bed barely able to move from sore muscles. I wanted to quit. I hated being watched at the gym and wanted to hide. I hated "big boy weights" (free weights) and felt out of place, but with the help of great friends, I learned to shove my headphones in, buckle down, and go no matter who stared at me. Cleaning up my diet was the most difficult part because I have a huge sweet tooth. I became a personal trainer in 2012 and a spokesmodel for a protein company. I also became the face of activelife Guide magazine and look forward to working more with Adidas after recent shoots with them. I want to connect with more people through Facebook and other social media outlets so they can see my workouts, recipes, and fitness/health tips. Start small. Make your goals reasonable, but push yourself. Be positive. If you believe it, you can do it. Take pictures to compare down the road. Don't compare yourself to others. Progress at your own pace. Find a buddy to keep you accountable. Hang your goals in giant print on the pantry or fridge. Get a marker and write yourself positive "love notes." Check yourself out. Don't be afraid to flex in the mirror. Don't get comfortable. Keep moving and don't look back. Throw yourself into your goals and aspirations. Four letter words are unacceptable: can't, won't, quit, etc. I love recipes and workouts from Jamie Eason and Jennifer Nicole Lee. Those women are inspiring and make me push myself to be in better shape. I love following transformation stories. I read articles on supplements and diets constantly. Bodybuilding.com has always been my go-to for new exercises and routines, even ones "for guys." Someone has to show the guys up.